Because I am a crazy person, last week I decided on a whim to do another full episode of Silent InvenTOYry for next month. I immediately set to work ordering and organizing props and essential stuff for said episode, a few of which arrived this morning. For those of you asking why I’d do this (aside from be being, as stated, a crazy person)… well, I’m making some substantial tech upgrades to benefit both SI and my YouTube streaming, so I figured I need another big episode to help pay for those. Besides, otherwise there wouldn’t be another full episode until late July, so this one can serve as a buffer until then. That’s also why I decided to go ahead and post the introduction to Tasakeru‘s Second Volume as my update for this month. It’s short, I know, and I apologize for that, but I hope my Patrons will still consider it substantial. Speaking of Patrons, huge thanks to Rich, who became Patron #4 this past week! Every little bit helps, and your contribution will ensure that the content keeps coming. That’s right, APPLE FOOLS DAY is now less than two weeks away. This is your reminder that to participate in the chat on the night of the event, you must sign up for a FREE Picarto account. 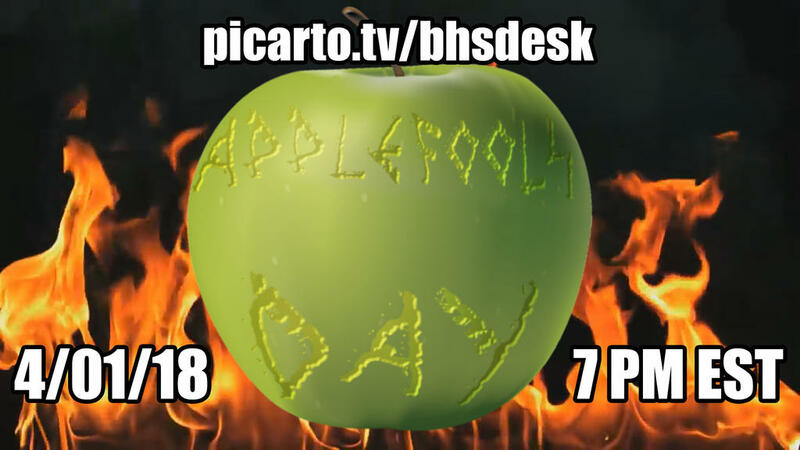 Due to potential legal issues, this stream will NOT be on YouTube, it will air ONLY on picarto.tv/bhsdesk at the designated time. But what is APPLE FOOLS DAY, you ask? Well, many details will be forthcoming along with a teaser trailer next week, but I’ll let slip a bit more: the event will be a live MSTing of sorts, a MSTing of something so baffling and bizarre that it should come as no surprise that everyone involved in making it, and I mean everyone, was out of their minds on heavy drugs… something so absurd that April 1st is really the only appropriate day to celebrate its incomparable insanity. Tasakeru Second Volume Introduction: COMPLETE!